Nicholas Pizza House is one of the original pizza places in the Northwest corner of Connecticut. We were the first restaurant in Torrington to start delivering to homes and businesses. For over 47 years we have been serving Pizzas, Grinders, Calzones, Italian dishes and much more. 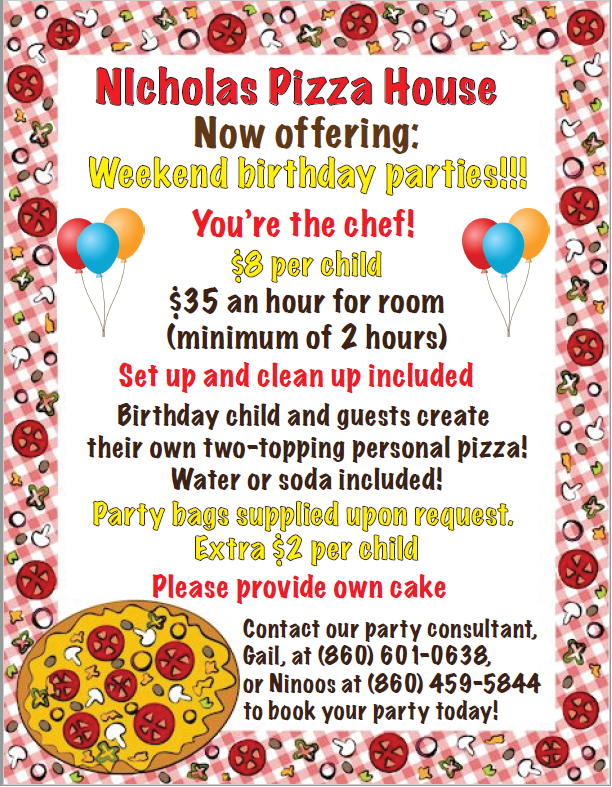 Upon entering Nicholas Pizza House your senses will be overwhelmed with wonderful aromas you will remember from your past. Those marvelous recipes are still being cooked here today! Peope still appreciate good old-fashioned homemade cooking. Our cooking is from scratch, starting with sauces to our dough! We've been using the original dough recipe since the restaurant opened. We realize our food preparation takes longer due to the care we put in to each and every dish. We want only the best for our customers! Come and visit us, and say hello to our wonderful staff.